Many legends referred to in medieval Germanic literature, ranging from the Old High German Hildebrandslied to Icelandic sagas, are set in the age of the Germanic Migration Period (4th to 6th centuries). The same goes for several Old English heroic poems, including Beowulf (set in early 6th-century Scandinavia), Waldere (about a legendary 5th-century Visigothic king) and The Finnsburg Fragment (set in Migration Age Frisia). The Old English poem Widsith too refers to this crucial period in the early medieval history of Europe. This blog post focuses on one reference in Widsith in particular: to the Burgundian King Gundahari (d. 437), who also appears in the much later Volsunga Saga (as Gunnar) and the Nibelungenlied (as Gunther). mid Sweom ond mid Geatum ond mid Suþdenum. with Swedes and with Geats and with the South-Danes. 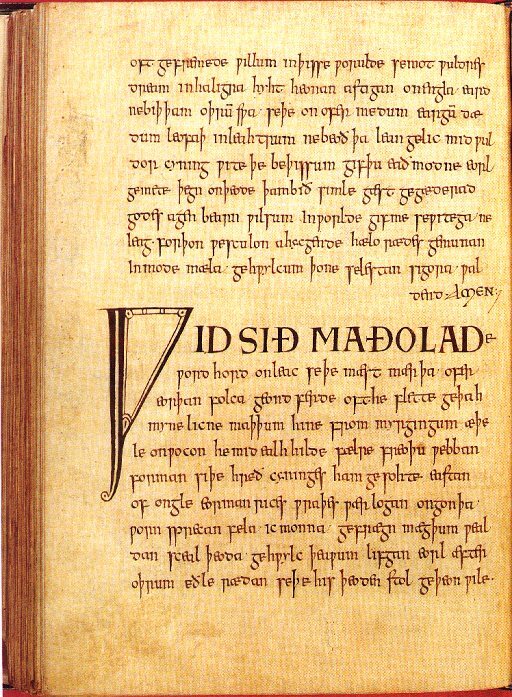 Widsith is the name given to a 143-line poem in Old English that survives in the 10th-century Exeter Book (but was probably composed centuries earlier). In this curious poem, the speaker identifies himself as Widsith [‘broad journey’]; an apt name, since he claims to have travelled among no fewer than fifty different tribes, ranging from Fins, to Huns, through to Saracens, Egyptians, Indians and Frisians. He also claims to have interacted with various historical figures, including Julius Caesar (d. 44 BC), Ermanaric, king of the Goths (d. 376) and Alboin, king of the Lombards (d. 572). Clearly, we are dealing here with a fictional travelogue, unless we assume Widsith truly spanned the known globe and lived to at least 650 years of age. as a reward for a song. That was not a thrifty king! This Guðhere is a historical king of the Burgundians who plays an intriguing role in various Germanic literary traditions. Gundahari was a historical fifth-century king of an East Germanic tribe known as the Burgdundians. He ruled a kingdom at Worms (Germany) which was overrun by Huns in the year 437. Gundahari was killed and, defeated by the Huns, the remaining Burgundians started to migrate and ended up in the area of Savoy (France). Sidonius’s gives the Burgundians a harsh review: they eat him out of house and home, they smell of garlic and onions, spread butter in their hair and sing horrible songs. It is most unfortunate that Sidonius did not record any of these Burgundian songs; who knows? They may have been singing of their king Gundahari and the crashing defeat by the Huns. That songs were indeed sung about Gundahari is further suggested by his appearance in other Germanic literary traditions. The thirteenth-century, Icelandic Völsunga Saga synthesizes various older (oral) stories about the history of Sigurd the dragon slayer and the destruction of the Burgundians. In the Völsunga Saga, Gundahari appears as Gunnar, son of Gjuki (that is: Gibica! ), King of the Burgundians. After a series of tragic events, Gunnar acquires the great treasure of Sigurd. This treasure rouses the interest of King Atli (that is: Atilla the Hun!). Through trickery, Atli lures Gunnar to his court and demands the treasure be handed over. Gunnar refuses and says that he has deposited the gold into the river Rhine. A battle between the Burgundians and Huns ensues and Gunnar is bound and thrown into a snake pit. Gudrun, Gunnar’s sister and Atli’s wife, helpfully hands Gunnar a harp and, in a desperate attempt to save his own life, the bound Gunnar begins to play the instrument with his toes. Almost all of the snakes fall asleep, but one stays awake and bites Gunnar to death. Gunnar, playing his harp with his toes, in a snake pit. Hylestad stave church (source). 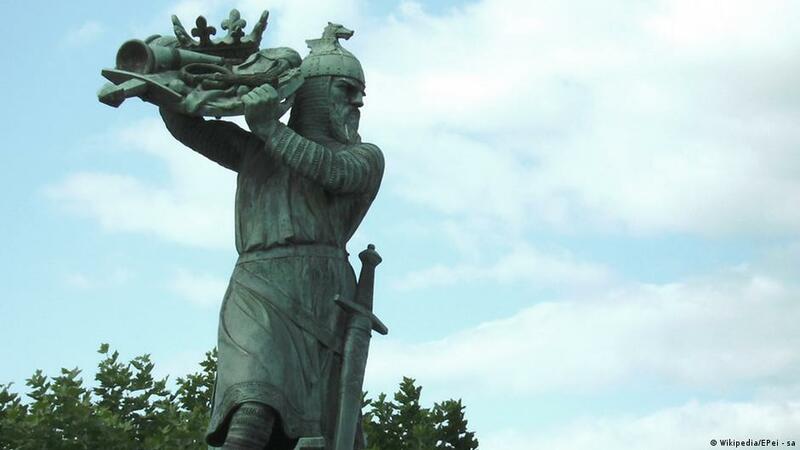 Variations of the story of Gundahari/Gunnar appear, among others, in the Old Norse Edda and the Middle High German Nibelungenlied (in this version, Gundahari is named Gunther and is beheaded by his sister – no sleepy snakes involved). The Burgundian king that was struck down by Huns in 437, it seems, had truly become a legend. The reference to Gundahari in Widsith attests to the fact that this fifth-century Burgundian king was also known in early medieval England. In this Old English poem, Gundahari is not linked to Atilla the Hun, there are no snakes, nor helpful (or vindictive) sisters; but the poem does associate the Burgundian king, explicitly, with treasure and song: this was not a thrifty king and he rewarded his poets well! These rewards, judging by Gundahari’s place in various literary traditions, certainly paid off! A medieval giant on display: Last resting place of Beowulf’s Hygelac discovered? N.B. Gundahari also gets a reference in the Old English Waldere, but that is something for another blog post!